Could a single net appliance hold the answer to problems resulting from the increasing complexity of IT infrastructure? “The need to consolidate on one device has never been more relevant than it is today,” Rich Lyons, a Citrix network channel development specialist told a recent IT World Canada webinar. The webinar, sponsored by Softchoice and Citrix, provided an overview of how a single net appliance can handle security, performance management and monitoring. 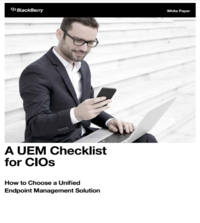 One of the biggest challenges in IT environments today is that there are too many points to manage and maintain, said Lyons. As a result, it takes too long to fix issues or to implement upgrades. That has a big impact on the user experience. A net appliance can consolidate all of the devices into one “tightly knit solution”. The appliance is software-based, which provides a huge advantage of scalability by eliminating the cumbersome hardware issues, said Lyons. “You can start small and pay as you grow.” He noted that the ability to handle a number of functions with one device is the reason the Citrix NetScaler is commonly referred to as the “swiss army knife of network appliances”. A net appliance can provide end-to-end visibility of the network and the applications. “You can manage, monitor and troubleshoot the entire infrastructure from a single unified console.” As well, Lyons noted that the device delivers 100 per cent application uptime by eliminating any single source of failure, and it speeds up application performance by using high-speed data compression. All CIOs are grappling with the increased security risks that come with a multitude of access points and applications. It can be especially challenging to provide secure access for a geographically dispersed or mobile workforce. Traditionally, IT managers have addressed this by adding on virtual private networks (VPNs) but, with the need for multiple passwords, this ultimately provides a poor user experience, said Lyons.